Behavior: Like most of its congeners, the Saltmarsh Sparrow is a shy and furtive bird, running and walking beneath spartina and other marsh vegetation as it feeds; it occasionally ascends a grass stem or weed stalk, but disappears to the ground as soon as it fears it has been noticed by a human or other potential predator. Such perching has a precise objective for males on the breeding grounds. Saltmarsh Sparrows engage in what is known as “scramble competition polygyny,” in which males monitor their home ranges from exposed perches in search of any female, with whom they copulate, often by force. The male then resumes its perch and waits for the next female. Because—unlike the Nelson Sparrow—no male Saltmarsh guards a mate or mates, the male’s home range in this species is considerably smaller than that of the Nelson Sparrow, and thus densities are higher in any given marsh. Though longer-distance flight can be surprisingly strong, if low, Saltmarsh Sparrows are usually seen in slow fluttering flight from patch to patch of marsh grass; the landing is especially clumsy, and the bird often simply falls into the vegetation and disappears from sight. Saltmarsh Sparrows often run or creep away on landing, only to appear after many seconds clambering up a stem or stalk. Males may sing from a low but fairly conspicuous perch, or they may remain beneath the modest canopy of grasses, even on the ground. This species does not have a stereotyped flight song with a regular ascent and descent, but males may continue singing incidentally as they fly from perch to perch over the marsh. Voice: On the breeding grounds, song is a helpful way to distinguish male Saltmarsh and Nelson Sparrows. Saltmarsh Sparrows do not sing the primary song given by Nelson Sparrows, audible to human ears as two gasping buzzes. Neither does the species normally perform the flight display commonly seen in Nelson Sparrows, in which a primary-like song is preceded by twittering tickings. 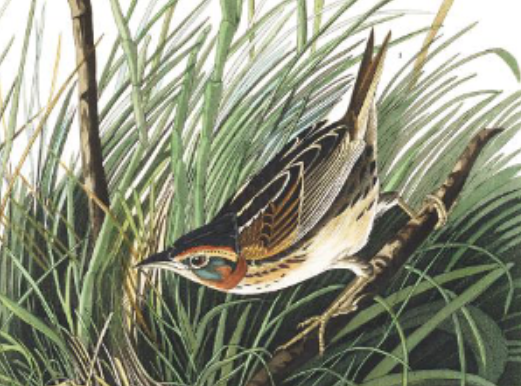 Conversely, the “whisper” song of the Saltmarsh Sparrow is without a counterpart in the vocal repertoire of the Nelson. This quiet and inconspicuous song, given from a perch or in horizontal flight between perches, comprises a series of phrases—sometimes lasting more than a minute—made up of a ticking introduction, short trills or mordants, and a longer, lower-pitched trill; phrases may be separated by a variable number of clicking notes, but are usually performed in a continuous, run-on delivery. Saltmarsh Sparrows call only infrequently in migration and winter, a very high-pitched, thin teek without noticeable attack or decay; it can be given in a fast series by birds under stress. This call is probably not distinguishable from that of the Nelson Sparrow. Adult, Ammospiza caudacuta caudacuta: Tail feathers dull rusty brown with narrow blackish shaft streaks; central feathers longest, with sharply tapered tips. Rump and upper tail coverts olive-gray with fine obscure shaft streaks. Feathers of back and scapulars brown, with dark olive-brown centers and dull buffy white edges. Primaries and secondaries dull olive-brown; tertials gray brown with narrow blackish internal streak. Greater and median coverts gray brown with sooty centers and paler brown edges. Marginal coverts of underwing pale yellow. Nape gray-olive. Underparts mostly white, brightest on belly; upper breast, sides of breast, and flanks washed dull buff-yellow, brightest on breast sides. Sharp, narrow blackish streaks across breast continue down breast sides to flank, where they may become slightly broader and browner. Throat white, separated by narrow blackish lateral stripe from broad yellow-buff jaw stripe, which curls beneath soft gray ear coverts. Ear coverts bordered at rear by short dark brown crescent, above by conspicuous yellow-buff supercilium, tending to orange at lore. Narrow central crown stripe dull gray, bordered by broad lateral stripes, dark brown with blackish flecks and streaks. Long bill pinkish gray below, brown gray above, darkest on culmen. Tarsus and toe dull pinkish gray-brown. Juvenile, Ammospiza caudacuta caudacuta: Upperparts pale buffy brown. Broad pale buffy edges of scapulars and back feathers produce conspicuous paler streaks. Buffy breast, sides of breast, and flanks; belly paler buff or whitish. Dense fine streaking on breast, sides of breast, flanks, and often upper belly. Blackish crown with narrow buffy median stripe. Long bill pinkish gray below, brown gray above, darkest on culmen. Tarsus and toe dull pinkish gray-brown.